A disintegrating cardboard box bears a hand-scrawled label on its lid: Pieces of string to small to save. Who was the person who acknowledged he should not save these smallish pieces of string, yet carefully stashed them away? Could an image of a small, forgotten object, left on a dirty floor, be a more descriptive record of a person’s life than any obituary? Enter Justin Kimball, with his camera and his quiet observation, a completely different mission in mind. The homes examined are in many cases run-down, disintegrating spaces filled with the kind of possessions one might imagine of a miserly shut-in who has not left his house in several decades. The layers of detritus and dirt in these images illustrate years of occupation and existence; almost nothing is pristine. Illuminated by daylight, the colors and atmosphere of these places are of a predominantly New England type: cool greens, muted blues and beiges and greys, faded floral wallpaper and weathered wood floors. The images are a series of views, as perceived by the artist; close-ups of small, discarded objects, impromptu tableaux made up of a mantel, a desk, or a counter and the items arranged upon the surfaces, views through dingy windows. While there is no specific narrative binding the image sequence, a few patterns emerge in the images and through their repetition, a sort of rhythm develops. We see a number of views through doorways, into mirrors, and between rooms that compress space into layered planes of color, and a disturbing number of empty beds, most often stripped bare to reveal their striped mattresses. 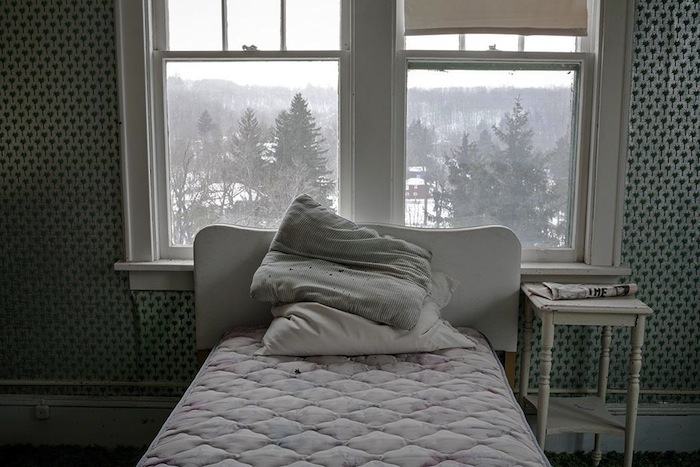 I found these images the most affecting; the beds exist in varying levels of tidiness, or even decay, as one decomposing mattress has begun to sprout leaves. My personal favorite is plate 16, in which a tiny, cluttered room, illuminated by a single shaft of sunlight, contains a rumpled, stained cot surrounded by piles of old newspapers and books. I imagine the days, months, even years its occupant spent lying there, and I want to know more, but I suspect it will be a sad, troubling story. Very few of the images actually give clues to an identity, but one of the last images in the book captures a long, handwritten note on a door next to a sticker which reads, Security Check by Sheriff’s Office. Reading the note, the viewer suddenly comprehends the fate of this house’s occupant. At this point, I would be remiss if I didn’t mention the physical appearance of the book itself. Accompanied by the essay printed as a separate pamphlet, the softbound book contains 60 color images, gorgeously printed, for the most part presented as single images opposite a pristine white page, and interspersed with a few enlarged images spanning both pages of a spread. It comes cleverly wrapped in a pale trifold slipcase held firmly shut by a wide, industrial rubber band, such as one used as a tourniquet for drawing blood. I confess, the packaging was a bit too clever for me; at first glance, it looked as if the hardbound case was damaged, seemingly marred with scuffs, scratches, and water stains – had it been left carelessly on a table, subjected to spills and stains? It turns out this is deliberate, and Radius Books has outdone themselves again with a memorable package design. Evoking the subject matter of the book, the cover itself suggests a remnant; a forgotten and abused object rather than a pristine new publication.